The recent bad weather in western europe gave rise to a death in a North Yorks river. For those unfamiliar with these Pennine fed streams and rivers, following heavy rain, the water levels can rise dramatically within the space of a few minutes as I know only too well. It was, I suppose, about 1960. I must have been about thirteen and my brother, Trevor, was ten. We’d spent part of Saturday evening, over the road from our bungalow, digging for earthworms in a drainage ditch, in readiness for the next day’s fishing. 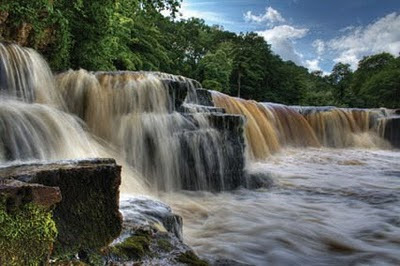 It was a familiar pattern for two fishing crazy boys who spent every weekend they could, fishing, either the small beck that ran through Catterick army garrison or the river Swale at Richmond in Yorkshire. The fishing craze had started two years earlier, when Trevor arrived home with a ridiculously small trout caught in the beck. Soon, I too was caught up in the lure of angling and days of kicking a football from dawn till dusk, gave way to the more leisurely pursuit of walking river banks and stalking fish. Christmas and birthday presents consisted of fishing tackle, rather than Dinky Toys, and our reading changed from ‘Roy of the Rovers’ to ‘Mr Crabtree Goes Fishing’ and the Angling Times. Next morning, soon after dawn, with our parents still fast asleep, we made our way to the bus stop, full of youthful anticipation of the day ahead. It had rained, quite heavily, the night before and our talk was of our hopes that this would have muddied the water and improved our chances of a catch. Puddles were everywhere on the ground and the menacing, leaden skies contained only the odd blue patch, giving little hope of better weather. Dark fluffy clouds scudded before the cool and stiff, easterly March wind and we were appropriately dressed in warm woollen jumpers. By the time we alighted from the bus at Richmond station, we had decided to fish upstream at the waterfall, always a favourite because below the falls, the water ran into some deep pools. The Swale was once considered one of the fastest rivers in England, draining water from the Pennines via Swaledale; a land so beautiful with its rolling hills and dry stone walls, that, although I’m a Lancastrian by birth, I consider it my true home. As we started across the fields on the southern bank, we passed in front of Richmond School Yorkshire, in those days, a boy’s only grammar school; a splendid old seat of learning. I spent many a Latin lesson, learning why ‘Brutus Roman ivit ut Caesarem videret,’ and gazing out of the large windows overlooking the river, daydreaming of catching the ‘big one’. I learnt to play rugby and cricket there, being briefly famous for being able to bowl a fierce leg break like Shane Warne, twenty years earlier than the Australian legend. As we approached the falls we were relieved to find no other anglers in sight and set up our simple tackle, consisting of bamboo rod and spinning reel. Threading the line through the eye of the hook was difficult; our cold and excited fingers shaking with growing anticipation; eager to get our lines in the water. We fished with a floated worm, hoping to lure a dace, a grayling or a chub; perhaps a trout, if we were lucky. We began by fishing immediately below the falls, trotting our worm downstream towards the shallows, the water still too clear to help with our deception. After a fruitless half hour I said to Trevor that I was going onto the falls and would fish the pool from above. Beneath the famous Norman castle, the falls at Richmond are beautiful, fifteen to twenty feet high and perhaps, fifty or more yards wide. When the water level is low, as it was when we started fishing, the river stream passes over the falls on the lowest parts and it was possible, by jumping the water courses, to cross over to the far bank with dry feet, especially in my Wellington boots. Happily, despite the lack of bites, I stood on the top of the falls and fished downstream from my lofty perch, while Trevor, also fishless, continued from the bank. As each pool yielded no fish, I moved towards the centre of the falls where I became aware that the river conditions were changing. Slowly at first, but becoming more apparent with every passing second, I noticed that the river level was rising around me so that I had to move my tackle bag away from the encroaching water. Trevor shouted out a warning, but I was, by then, stranded on higher, dry ground, cut off from both banks by the increasingly rapid torrent. I hadn’t started to panic, as I thought all would yet be well, if only the river would stop rising. I began to feel foolish. I knew it had rained heavily the night before and I was experienced enough to know how the river behaved and should have anticipated this happening. All the Yorkshire Rivers that run off the Pennines into the North Sea are susceptible to often fatal, rapid rises in water level. If I was feeling foolish, the fish had made no mistake and had already taken refuge, oblivious to all our attempts to persuade them to feed on our bait. My ‘island’ of dry ground was now, beginning to disappear as the water deepened and quickened all around me. The noise was beginning to hit me; from the gentle tinkling sound of trickling water to the outright roar, reaching a crescendo, such as you hear at all the famous big falls of the world. The water was encroaching quickly and soon lapped at my Wellingtons and started rising up my legs. Then the water was over the rims of my boots, rising ever faster. It is strange, but as adrenaline flooded through my blood, I didn’t register the intense cold of the water. Fear began to overwhelm my other senses as I looked upstream and saw the huge volume of water heading my way, bearing down on me like the Severn Bore. I briefly saw Trevor watching from the bank, helpless, and I turned to my own well being, clutching my tackle bag and rod as if my very life depended on it. In a few seconds, as the water reached my waist, I could feel my feet losing their grip and I instinctively leaned into the current. Then, before it reached my chest, my resistance was exhausted and releasing my tight grip on my rod and bag, I was swept over the raging falls. It seemed a long drop and I felt I was in slow motion. Time enough to pinch myself to make sure I wasn’t already in heaven, so beautiful and serene was the sensation of being borne along. I was jolted into reality at the bottom of my plunge, as the freezing cold of the peaty coloured water hit me for the first time. Luckily I hadn’t collided with a large rock as, at that speed, I would have surely perished. I was still submerged and could feel myself being propelled along by the current. I had to get my head above water and, in what seemed like ages, but was probably only a few seconds, my feet were touching the bottom. Amazingly, my Wellington boots were still attached to my feet. The current was too fast for me to get a grip and I was rolled along, my body bouncing off rocks that were once above river level, but were now submerged. I was still holding my breath, my head bobbing in and out of the water, as I was swiftly carried even further downstream, in a precipitous rush to the sea, my flaying hands and arms trying to snag a rock. Some seventy or so yards downstream I finally came to a halt against a boulder, which I held on to for dear life. I felt exhausted as I breathed in my first lungful of air and took stock of my situation. The water was shallower here, but I was still too frightened of drowning to do other than just cling to my rock. I was aware that I was still in mortal danger; that I had to do something as the freezing water was still rising rapidly. For the first time I felt real panic, as earlier I’d had no time to think about the danger. Now, I feared that if I released my hold on the rock, I would be swept away to my death. Although I was now sixty or seventy yards below the falls the noise was still deafening but my ears caught another sound; somebody shouting. Looking to where I thought the sound came from, I saw an angel, a young girl, slightly older than I, wading towards me with her father behind her. With the water up to their knees, they were urging me to get up and make a dash for the shallows. Drawing on the energy one conjures up in life or death situations and with the water threatening to engulf me once again, I rose to my feet and staggered the twenty or so yards, into the safety of their welcoming grasp. I had made it; I had survived! They took me to their home which overlooked the falls and gave me some dry clothes to change into. The young girl’s mother gave me hot, sweet tea, in the British tradition, while the daughter was dispatched to intercept Trevor, who having seen me swept away, had presumed me lost and was heading back to the bus stop and home. What he was thinking and feeling as he walked back across the fields must have been dreadful. What does a ten year old, who had witnessed his brother drowning, tell his parents? A relieved Trevor was driven home to break the news to my parents who came to collect me with fresh clothes of my own. As my mother later told me, my parents had no idea where we were and although cross, they were just too relieved that the day had ended happily. The story should finish here, but for some families, the day would end with tragedy. 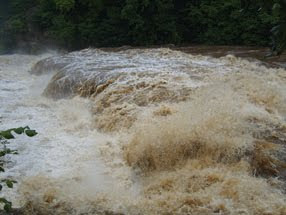 Due to the swollen waters of the River Swale, downstream at Topcliffe, lives were lost, and helicopters were called out to rescue others. Now, many years later, I often wonder what became of my angel, the girl who saw my plight and came to my rescue. Shamefully, I don’t even know her name; whether she still lives in Richmond and indeed if she’s still alive. After all these years, it would be nice to know, and if she is still alive, to be able to say, “Thank you”.